It's almost officially fall, as I've said before. One of the first ingredients I think of for autumn recipes is cinnamon. I love cinnamon, and it reminds me of "harvest", which makes me think about Thanksgiving. We are no where near Thanksgiving (sort of) considering that Halloween is coming up soon, but that's okay. I could really eat cinnamon anytime of year. You know what goes well with cinnamon? Crunchy streusel. You know what goes well with almost any breakfast treat? Crunchy streusel. Oh man do I love a good crunchy streusel. 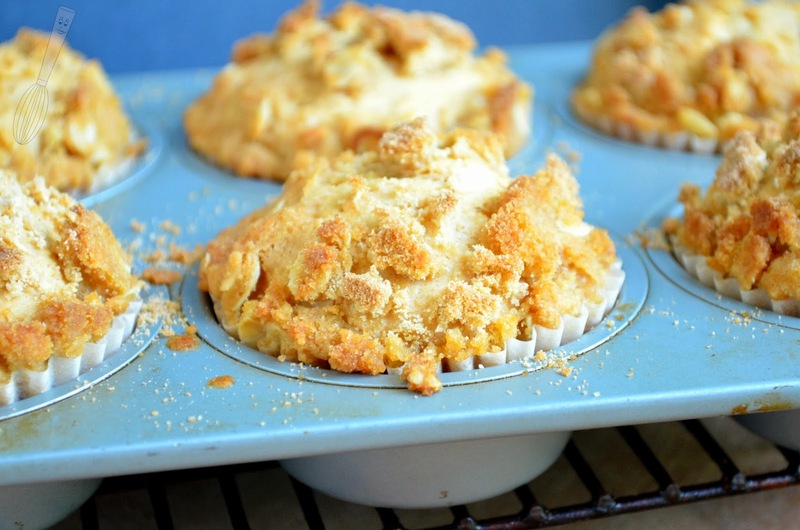 It takes butter to make it crunchy (usually) but it's worth it to me because the combination of the soft muffin and the slightly sweet, crunchy streusel is perfect to me. Did I mention that this isn't one of those soft and melty streusels? The muffins just have a hint of cinnamon but it's so nice. Have you ever put to much cinnamon in something? It's not good. Not good at all. I've also learned my lesson with the proclaimation "there can never be enough cilantro in salsa!". Yes...there can, but that's a story for another day. Another great point about this recipe is that it only makes 6. 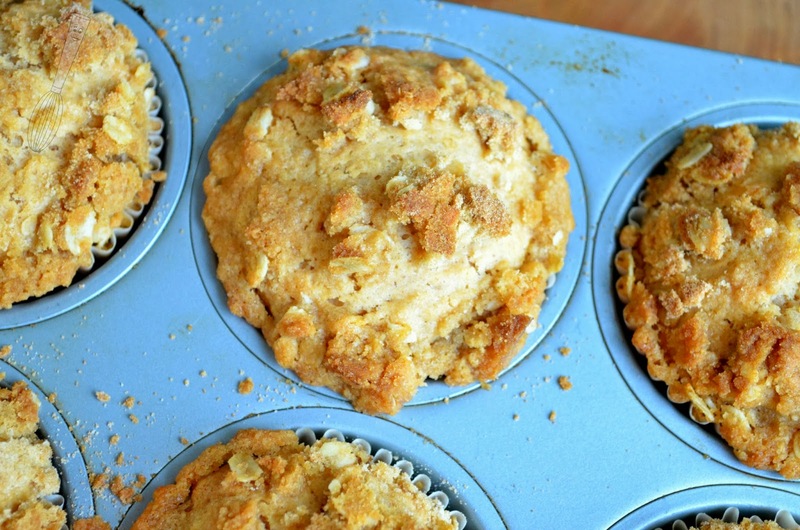 I don't know about you but I don't need a dozen muffins lying around, ever. Granted you could freeze some of them but why would you want to do that. You could just share a few with neighbors or friends too, especially if your neighbors are your friends. I try to make an effort to not make to much of any particular recipe just because I don't ever want to have lots of something around, especially if it's delicious. 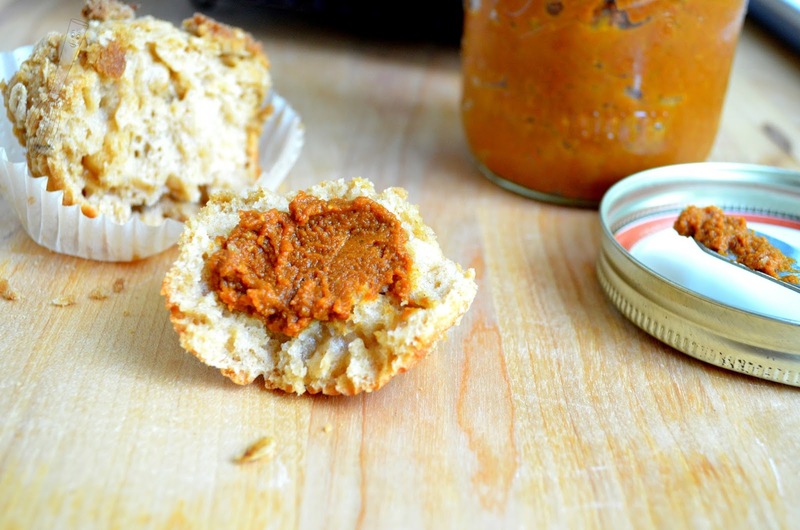 I served these cinnamon muffins with my Pumpkin Pecan Bourbon Butter and they were so so good. I also recently tried the Pumpkin Pecan Bourbon Butter with pancakes. Yes, you should! Sounds like a great weekend breakfast to me. Yum! 1. Preheat oven to 375F. Line a 6-cup muffin pan with cupcake liners. 2. In a medium bowl, add flour, brown sugar, baking powder, salt, and cinnamon. Stir until blended, then make a well in the middle. 3. Add the egg, sour cream, apple juice, and canola oil to the flour mixture. Stir the batter until just combined, do not overmix. Evenly divide the batter between the six muffin cups. 4. In a small bowl stir together the ⅓ cup light brown sugar, ⅓ cup flour, and oatmeal. Using your fingers or a pastry blender, cut the butter into the flour mixture until it forms small crumbs. 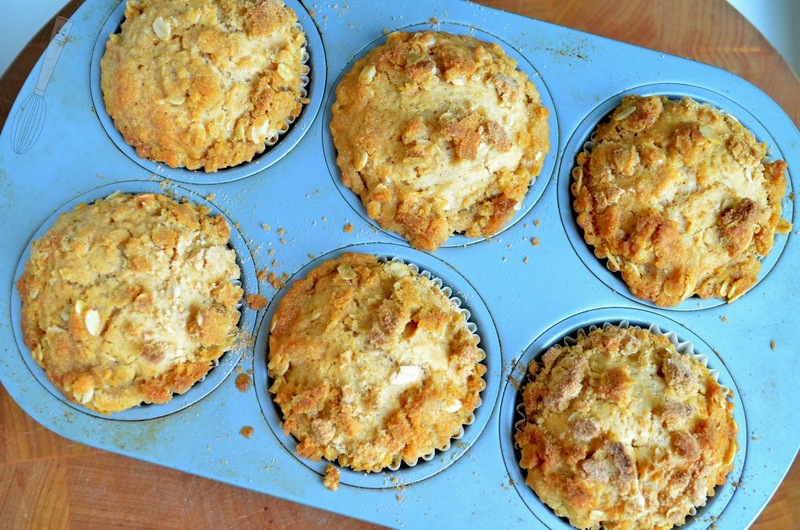 Sprinkle the streusel evenly over the muffins. 5. Bake the muffins for 18-20 minutes or until a toothpick inserted into a muffin comes out clean. Cool several minutes in pan then remove from pan to a wire rack to cool completely. Ghost Pepper Mac & Cheese for Meatless Any Day?